pretty different from what I've shared with ya so far. Remember you could create this with the colors that suit you best. Fancy Napkin naked wood plaque, small wood block, gesso, Mod Podge, black pigment ink (I used Mixed Media ink), white paper flowers, fancy flowers, rhinestone chain (or bling), alcohol inks (Ranger), piece of Stampboard or something similar, scrap of card stock, tooth picks, sanding file or sand paper. 1. Paint the plaque with a coat of gesso and let dry. Then Mod Podge a fancy napkin onto it. be sure to separate the layers of the napkin and only use the top, pretty layer. Once it's dry, sand around the edges. 2. Get your piece of stamp board (or whatever white, shiny thing you're gonna use. 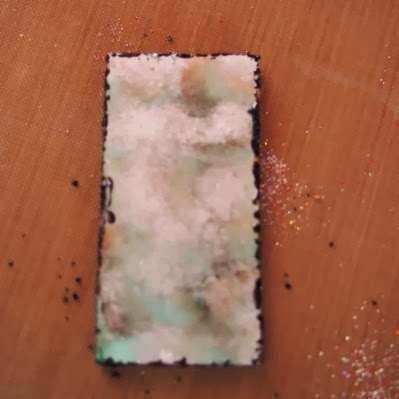 You could sub a piece of chip board with some glossy card stock stuck to it) and coat with the alcohol inks. I used Silver & Aqua with a little bit of Rust. 4. Now gather your darling Piccolo pieces. Punch the bits out of the dress form. Coat the dress form with enamel adhesive fluid and Vintage Black powder. Heat well an add a second coat if desired. The swirl was done with Aged White. Two of the flowers are White Micro powder, and the rest of the flowers are Cranberry Wine. 5. Dot the alcohol inked piece with enamel adhesive fluid and sprinkle on some powders. I used a little bit of each color listed in the supplies. Heat it up, baby. Do the same with the white paper flowers. 6. Flip the dress form over and use a toothpick to coat with E600. Stick to a piece of card stock and trim. 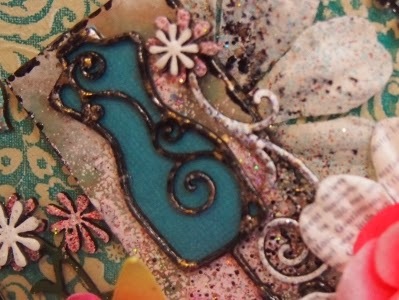 Add more glue and adhere to the inked/embossed piece. 9. Your final step: flip the plaque over and use the E600 to glue the wooden block to the back. This will act as a little stand and make your piece stand on its own, no easel required. What a great work of art. I would love the have this piece. 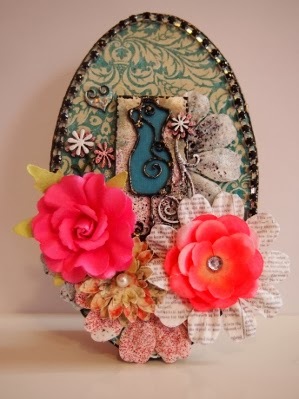 Gorgeous, love the vintage look and the variety of enamel colors you used for the frame and flowers. So pretty with the lovely bright flower embellishments. 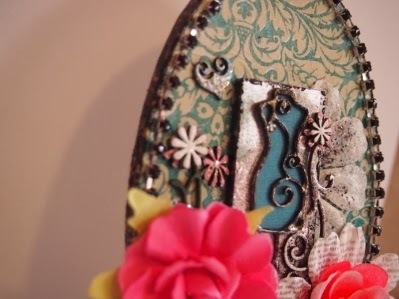 Oh very cool piece of home decor, Aimee, love the shabby chic look.